Abdullah Al Othaim MarketsGet the official application of “AbdullahAlOthaim Markets” to save more with it and know more about it.browse all Abdullah AlOthaim Markets products via its cataloguewhich is categorized to many categories for your convenience,Categories includes fresh, baby needs, grocery, health beauty, homecare and electronics ,then you can find the product you need withits price, rate your favorite products.Do not miss our amazingpromotions and offers festivals as well as the corners promotions,hyper and super markets promotions, really you will feel as you areinside the store exactly from your mobile!.Explore and findAbdullah AlOthaim Markets stores quickly, Find the nearest storefrom you , We are taking your shopping experience to a whole newexperience as you can now buy directly from your mobile...Too manyproducts and brands? 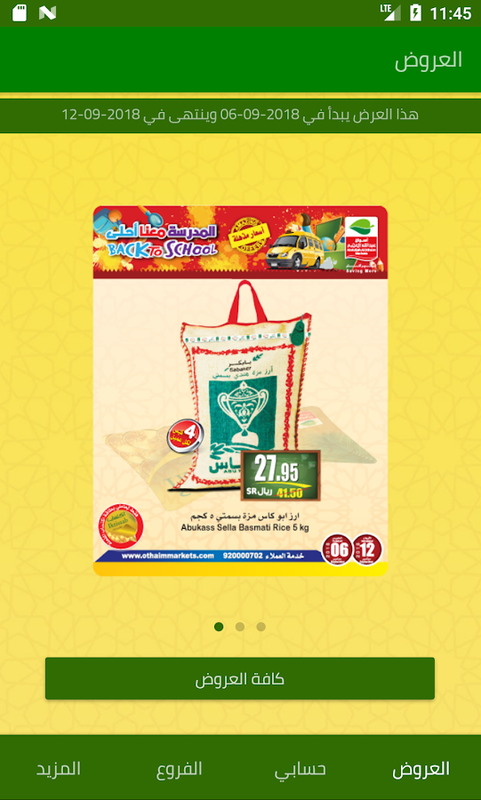 Do not worry, you can search all the productsby brands or price and you will find the suitable products for yousimply and quickly.Know all Abdullah AlOthaim Markets latest newsand announcements, besides you can submit all your suggestions andinquiries directly. Abdullah AlOthaim Markets Markets applicationsupports Arabic and English Languages. Thanks for using MySTC. Manage your STC accounts with the MySTCAndroid app, which gives a full android user experience. providesaccess to your bills, data and call usage, subscribed packages andservices, the latest STC offers and much more. - Manage your STCprofile - Login with your STC Online account or using a One TimePassword - Instantly view all your information at a glance with theMySTC dashboard - Support for Jawal, Hatif and Sawa numbers - Viewyour latest bill, as well as previous bills - View your up-to-date(real time) internet data usage - View your Qitaf details, andredeem your Qitaf points instantly - View your STC packages andservices, and instantly subscribe/unsubscribe - View all your callusage, and switch between name and number - View the latest MySTCOffers - View all STC outlets, kiosks and Tamayouz outlets - Viewyour Tamayouz account information and the latest Tamayouz offers -Link any Sawa number with your ID - Recharge your Sawa numberinstantly Tags: MySTC , STC , Saudi Telecom Company . Ayah is a full-featured Quran app that is beautiful and easy touse, the winner of the Kuwait International Prize for the bestQuran app, brought to you by Tafsir Center for Quranic Studies. ●The Best Quran Reading Experience ●‬ ‪Enjoy the most crisp andclear text of the Quran in the original Uthmani font.‬ ‪●Distraction Free ●‬ ‪Immerse yourself in the text with a clean,distraction-free interface.‬ ‪● Speed ●‬ ‪Ayah is fast and reliableso you always have a comfortable reading experience.‬ ● Recitation● Gapless verse by verse recitation by select reciters with fullsupport for background playback, number of repetitions, and sleeptimer. ‪● Search ●‬ ‪Search the entire Quran with instant results,or jump to a specific page by entering its number. ‪● Track YourKhatmah ●‬ ‪There is only one bookmark that moves from a verse toanother to help you easily track your progress.‬ ‪● Favorites ●‬‪Favorite as many verses as you'd like for quick access.‬ ‪● Notes●‬ ‪Capture your thoughts while reading the Quran.‬ ‪● Share WhatYou Read ●‬ ‪With a few taps you can share a verse or multipleverses as text or an image in the beautiful Uthmani font.‬ ‪● NightMode ●‬ Try Night Mode for easier nighttime reading. Aswaq.com is a pioneer Saudi company. Our head office is located inthe Kingdom of Saudi Arabia specifically in Riyadh. Since we areSaudis and we speak the same language, we tailored our offering tomatch your needs and provide you with a smooth and exceptionalshopping experience. We bring all markets to you by offering you awide range of products and services through a variety of productsincluding electronics, mobiles, computers, home & garden,office supplies, health & beauty, baby & toys, fashion, andsupermarket. Aswaq.com promises fast shipping and a variety ofpayment options from all major credit cards to cash on delivery. Webelieve that the Saudi community deserves the best so we promise todeliver 100% authentic products with a flexible return policy andreliable customer care. Enjoy shopping at your new favorite Saudishopping destination.